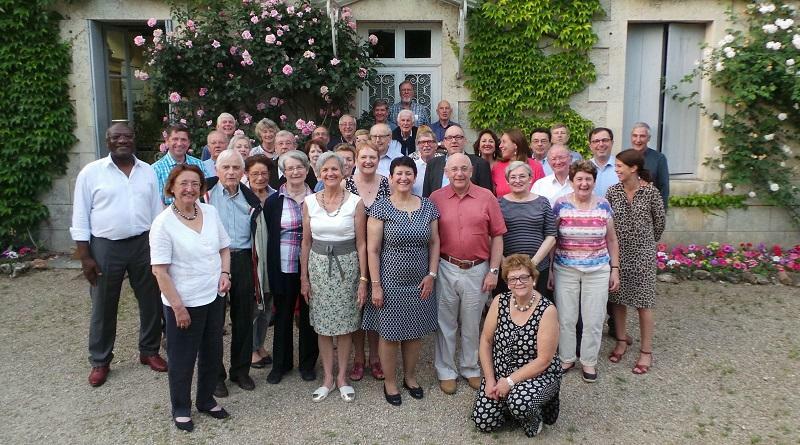 The annual reunion kicked off with a drinks reception at the house of the President, Magloire Kinde, where everyone was able to renew old friendships and meet new participants. 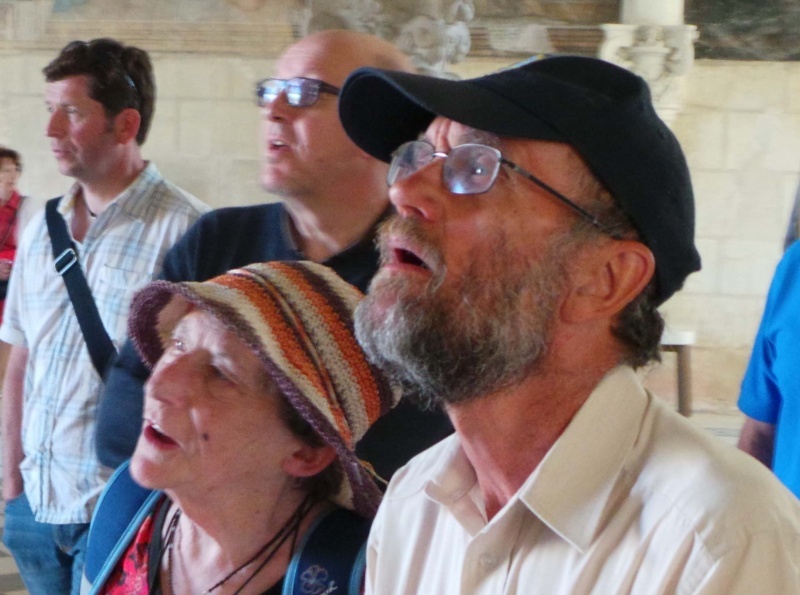 The programme got into full swing early the following morning when it was "all aboard the mystery bus" and off towards Saumur to visit the magnificent Abbaye de Fontevraud. The Abbaye was built between 1105 and 1165 and is most remakable because the tombs of King Henry 11 of England, Eleanor of Aquitaine and Richard the Lionheart are found here in the splendid nave of the church. By now the sun had reached its zenith and the temperature had soared to 35 degrees and so we were grateful to be treated to a delicious lunch in the coolness of the Restaurant Le Plantaganet. 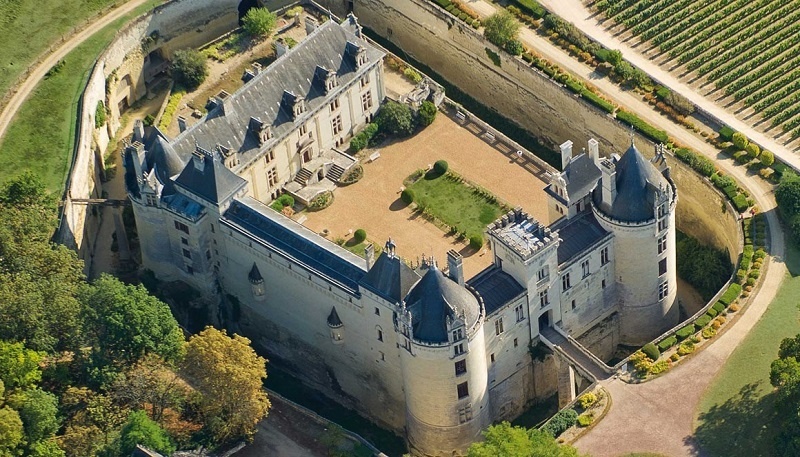 Refreshed, it was back in the coach for a very short hop to the Chateau de Breze, a beautiful Loire chateau with a surprise beneath. An earlier "trogolodyte" fortress was excavated by early 11th century settlers and we visited the extensive underground passages and caves on top of which the "modern" chateau was built by the Colbert family (a Minister to Louis X1V). Unfortunately, the sun was unrelenting and, as much of the tour was conducted outside, many of our party had to withdraw into the shade of the trees! The coach returned us to Poitiers by about 6.30 p.m. and, in theory, we were supposed to arrive at Le Restaurant du Moulin de la Noree at 7.00 pm. In reality, by the time everyone had returned to their quarters, showered and changed, the Gala Dinner was never going to get going until 8.30 pm. By the time we had started the Presidents' Speeches, the aperitifs had still not been served and Magloire was a little embarassed to give a toast to his guests when no one had anything in their glasses! In perhaps typical French style, the dinner meandered slowly forward and it was well after midnight when desserts and coffee appeared! On the plus side, the restaurant was a beautifully restored water mill in an idyllic woodland setting with the river running through the middle of the dining room. 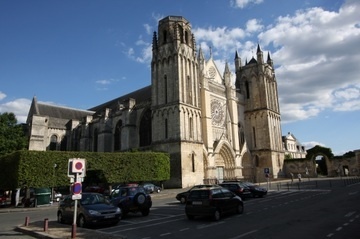 Another early morning rendezvous was planned for the Saturday to visit Poitiers on foot. Some members of the party decided that a leisurely breakfast was preferable to walking round the Cathedral and the many churches which Jean was planning to visit and the very hot sunshine limited activities somewhat. Everyone finally met up for a "charcuterie & wine lunch" at the cafe "O Gibolin" in central Poitiers before enjoying a free afternoon with their hosts. In the evening we had quite a long drive out into the country to enjoy a splendid evening in Michel's lovely rustic garden. An endless flow of wine, whisky and punch was complemented by the most delicious canapes prepared by the ladies and we were all fascinated to see the main food event which was a Mechoui - a whole lamb roasted over a barbecue in North African style. 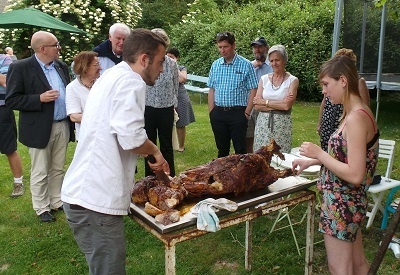 Once the meat was crisped to perfection we all trooped into the barn to eat our fill and continue our conversations in broken French, German and English with our delightful hosts and our German friends.